Fig. 1. 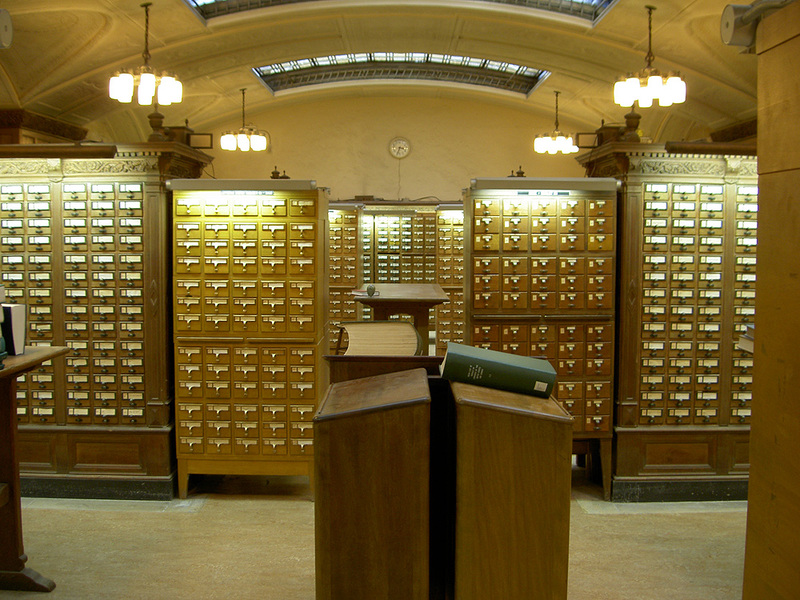 Card catalog from the Sterling Memorial Library at Yale University, 2005. Photo by Henry Trotter. Image courtesy Wikimedia Commons. We’re not arguing for a turn to scale in modernist studies. It’s too late for that. The turn to scale began geographically at least 15 years ago, with the new theories of world literature and with the call, within modernist studies, to recognize larger ambits for the sourcing, making, developing, and adapting of modernist art. What has been called “the transnational turn” and, later, “global modernism” is surely part of a first re-scaling in modernist studies. Around the same time, the turn to scale also began archivally, with the creation, substantial expansion, and significant use of digital collections, which offered new ways of accessing, parsing, and arranging early twentieth-century manuscripts, books, and journals, as well as artworks in several media, including verbal, visual, and audio. The first turn focused our attention on the choice between very small and very large, and this was a crucial intervention. But the subsequent emphasis on extremes has been limiting. Haggling over the relative benefits of close reading and distant reading has reinforced the notion that “close reading” involves (only) micro-analysis whereas “distant reading” involves (only) macro-analysis. However, as Paul Saint-Amour points out in his contribution, distant reading involves a combination of micro and macro: giant corpuses, yes, but the analysis of miniature devices, book titles, or single words as they appear within those corpuses. Close reading, too, oscillates from micro to macro: we often dilate out from the analysis of one exemplary work to broad claims about an oeuvre, a genre, a period, or a culture. Yet distant reading methodologies, in their initial pushback against the isolation of individual texts, handfuls of texts, and even literary traditions, have encouraged critics to prefer very large quantities of data. Close reading methodologies, in response, have held fast to the small and near. The new turn to scale begins from the assumption that our scholarship has been constrained by the opposition between micro and macro archives. The essays collected here move beyond that opposition in three principal ways. First, they focus on the mechanisms that get us from one scale to another, bringing new attention to “meso” or middle scales while also emphasizing the intellectual risks and processes of correlating objects across cultures, languages, and social divides. This focus constitutes a distinct moment in scale-attentiveness because it involves methodological reflection (a historical view of the field) as well as remediation and reframing (some examples and projections of where the field can go). Second, they are turning away from the choice between micro and macro in order to focus on the humanistic contributions of scale-attentive scholarship. Humanists and non-humanists alike have argued that enumeration and digital calculation are servants of social abstraction, but these essays show that an emphasis on the size and number of the literary object (e.g., How do editions and translations alter the location of the literary work? How do new formats and media change the calculation of audience and community? What is the relationship between political and formal inclusion?) adds nuance and detail to the study of social marginality. Humanistic approaches to scale can generate new knowledge about the temporal and spatial largeness of subjects such as climate crisis, environmental change, and globalization. So, there are really two sides to this coin: scale-attentiveness serves humanistic inquiry, and humanistic inquiry serves interdisciplinary projects that operate well beyond the purview of the humanities. The third way that these essays are moving beyond micro and macro is by calling upon the resources of other disciplines. They do this in order to compare, synthesize, and diversify scalar methodologies. Thinking about scale in literary studies, contributors suggest, can benefit from thinking about scale in performance studies, translation studies, book history, the sociology of institutions, library science, gender studies, and postcolonial theory, among other fields. No one is likely to dispute the claim that importing new approaches will enrich a field, but these essays are remarkable for the range of new methodologies they do import and for the meticulous work they do, in a very condensed space, of showing how questions of scale change the way we do business in the editing, archiving, canon-building, and classroom teaching of modernism. Because they are multiplying the levels and uses of scale as a framework of analysis, because they are highlighting the humanistic qualities of scale-attentive scholarship, and because they are combining methodologies of scale with an extraordinary range of other methodologies and disciplines, whose own scalar qualities they are helping to identify, the essays assembled here constitute a new or second turn. Rather than continuing the first wave of scale-attentive scholarship, they are taking stock of that wave and revising extant methods in the light of perceived blind spots. They are also rebalancing the paradigm, shifting intellectual weight from an emphasis on the scale of reading to an emphasis on the scale of the work. What we need at this time is a larger toolkit for understanding the time, place, and substance of literature. What are the proportions and boundaries of the literary object? How many objects is the literary object? Are translations part of the work? Are they new works? What happens when works of literature move across media, formats, and institutions? These questions invite us to reevaluate the fundamental methods of our discipline: namely, how we designate the literary work; how we establish relationships among works; and how we generate social, political, and, yes, literary arguments about exemplarity, representation, and kind. As humanists, we are good at thinking about the relationship between formal and social principles of enumeration: formal, when we ask how characters, editions, and libraries are aggregated, and about the losses and gains of aggregation; social, when we ask about sample and voice, the relative centrality and marginality of anecdotes and audiences. By “scale of the literary object,” we mean a range of things. For starters, what is intrinsic, and what is extrinsic to the work of art? Tsitsi Jaji argues, for example, that we need to think about the time of rehearsal as well as the time of performance and production when we think about the analysis of art-songs. She shows that including rehearsal and performance, which involves shifting the temporal scale of the work, allows us to consider how art-songs by black composers have been received, circulated, and adapted, and by whom. Jaji’s approach intersects with Katherine Fusco’s, Pamela Caughie and Sabine Meyer’s, and Jacob Edmond’s, because they all show that enlarging the scale of the object, by including translations and letters or by analyzing a regional library collection, changes both the practice and the outcome of literary analysis. It requires new skills and sometimes collaboration among researchers, creating new social dynamics within scholarship and reception. Enlarging what counts as the object also brings new visibility to the social dynamics of production, allowing us to see how the multiplicity of object reveals a more complex sense of an artwork’s origin and intended audience. The scale of the literary object leads back the intrinsic description of the work. Sam Alexander challenges what we mean by socially “big” and socially “small” novels, and especially our assumption that Victorian novels will always represent more characters and more detailed relationships among those characters than modernist novels will. Alexander asks us to think about the relationship between formal and social marginality by looking at the number and arrangement of characters in novels such as Mrs. Dalloway and U.S.A. Here we can see a very clear example of how the enumeration of connections among characters in the narrative contributes to an analysis of social collectivity, in particular an analysis of what it means for characters to be isolated from others and how modernist artists went about representing that. Finally, the scale of the literary object can help us consider the history of categories and institutions. In Merve Emre’s and Ben Baer’s essays, the question is really how to compare and correlate literary works that operate in different sociological and cultural spaces. Scale-attentive scholarship is now asking what happens when counting breaks down, when literary objects fail to fit with other literary objects, when there is blockage or friction in the process of aggregation and expansion. Many of the essays collected here concern themselves with these moments, and it seems to me that above all this is a sign of the field’s health and growth, rather than its decadence. Because we study history, humanists know better than most that failure and misfire are crucial to intellectual progress. We are indebted to the first turn to scale for enlarging the geographic and archival ambits of modernist studies. The contribution of the second turn is a more textured account of how we get from one unit to many, how thinking about formal relations among units within and across artworks can help us think about social relations, especially the experience of marginalization, and how these humanistic approaches to scale can change the calculus of scale in other disciplines. Franco Moretti, David Damrosch, and Pascale Casanova launched a wave of thinking about literary histories at a “world” scale in essays and books they first published in English between 2000 and 2005. See Franco Moretti, “Conjectures on World Literature,” New Left Review 1 (2000): 54–69; David Damrosch, What Is World Literature? (Princeton, NJ: Princeton University Press, 2003); Pascale Casanova, The World Republic of Letters, trans. M.B. DeBevoise (Cambridge, MA: Harvard University Press, 2004). For an account of the transnational turn in modernist studies, see Douglas Mao and Rebecca L. Walkowitz, “The New Modernist Studies,” PMLA 123, no. 3 (2008): 737–48. Two of the first major books on the field of global modernism were The Oxford Handbook of Modernisms, ed. Peter Brooker, Andrzej Gasiorek, Deborah Longworth, and Andrew Thacker (Oxford: Oxford University Press, 2010), and The Oxford Handbook of Global Modernisms, ed. Mark Wolleager with Matt Eatough (Oxford: Oxford University Press, 2012). Eric Hayot and I discuss the global turn in our introduction to A New Vocabulary of Global Modernism, ed. Eric Hayot and Rebecca L. Walkowitz (New York: Columbia University Press, 2016), 1–10. The Modernist Journals Project, an early leader in the digitization of modernist literature, launched in 1995 but relaunched and was considerably expanded in 2003, when Brown University joined forces with the University of Tulsa. James F. English and Ted Underwood aptly describe the correction from the very small to the very, very large as a shift from “scalar contraction” to “gigahistoricis[m]” (James F. English and Ted Underwood, “Shifting Scales: Between Literature and Social Science,” Modern Language Quarterly 77, no. 3 : 277–95, 278, 280). For humanist critiques of digital humanities, see Daniel Allington, Sarah Brouillette, David Golumbia, “Neoliberal Tools (and Archives): A Political History of the Digital Humanities” in The Los Angeles Review of Books (May 1, 2016) and Timothy Brennan, “The Digital-Humanities Bust” in The Los Angeles Review of Books, May 1, 2016, and Timothy Brennan, “The Digital-Humanities Bust” in the Chronicle of Higher Education, October 15, 2017.